Good for you! Now all we have to do is narrow down your shoe choice based on the type of walking you want to do. Hang in there for this last little bit. Then you'll be ready to roam. ... with low heels and a flexible sole are the most comfortable for walking. They'll help with your push off from your back foot as you walk. Yoko loves her PU (polyurethane in case you forgot!) heels. They help her posture and balance. They have incredible shock absorbency and a built in 'memory' that helps them maintain their shape. ...to the terrain you'll be walking on. Dirt, gravel and rock paths call for a different type of outer sole than for a paved path, city streets or sidewalks. Look at the types of grip or lugs, type of material, and type of traction of the outer sole (the part that hits the ground). Sorta like tires for your feet! Off road calls for more rugged, deeper grippers, smooth roads call for a smoother 'tread'. Ready to shop? Find your perfect shoes here. Taking the tire analogy a little further you want different material hitting your road in summer and in the winter. The PU and TPU soles work very well in the summer months. As you start to have slippery, icy or snowy conditions you may want to consider a rubber type of outer sole. In parts of Canada where we come from, the temperature can hover just above or below freezing most of the winter, PU soles can be downright treacherous! Rubber is better. Rubber with a winter traction device is best. Sort of like snow tires with chains! We sometimes used a device called Yaktrax and walked with confidence on the iciest roads. 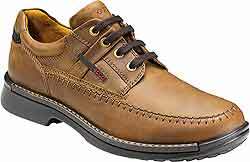 When you choose shoes for the winter months you want a heavier shoe, less cooling, rubber sole and an insulating liner. This last depends on the temperatures where you walk. We find it desirable as the temperatures go below 32 F or 0 C.
So - Choosing Winter Walking Shoes is like Choosing Winter Tires! I can remember that! 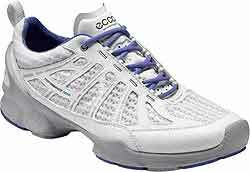 ...you want a lighter weight shoe with breathable upper materials for ventilation and cooling. You should almost always look for a lining that is designed to wick moisture away from your feet. This helps keep your feet cooler and drier. It minimizes blistering and sores on your feet. As noted in our discussion on Walking Socks, you need good socks designed specifically for walking that make up for the natural loss of fat pads in the feet at our age. 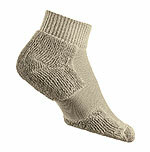 Remember that socks are the much overlooked but very essential part of your positive fitness walking experience. Please DO NOT wear cotton socks for walking. They have very poor absorbency and wicking abilities. Visit our Thorlo Socks page for much more important info. Do you need special anatomical footbeds or shoe orthotics? 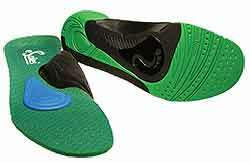 Then choose shoes with removable insoles. Trying to put a new insole on top of one that doesn't come out does NOT work! Here's a sample of the choices you can have. HINT: Narrow your search to your exact category using the column on the left side of the page. Find more tips on this here. There you have some basics to help you pick out your great pair of walking shoes. Great good luck with your quest!